It’s only snowing lightly and the wind isn’t particularly sharp, but as we round each canyon corner we can’t ignore the approaching dark weather. I eddy out, again. Just upstream I took a moment to gulp down a granola bar and hop about on land doing ridiculous body warming calisthenics. Now, I’ve decided to root through my drybag to find the wool neck warmer hoping to eliminate exposure for all but the skin around my eyes. It was the beginning of April and pre-launch on our seventh day of the trip. Throughout the previous night, the light sound of rain had gradually diminished as drops turned to flakes, which coated our cobblestone camp with a light dusting of snow. That morning, the sky shined greyer, the air, significantly colder, and the thin layer of frost encrusting our kitchen utensils added an unwelcome bite to our already frigid fingers. Meant to be our first full day on the river, today we would determine how many miles we could reasonably accomplish during daylight hours. So, although the Sheepeater Hotsprings that we had relished in the afternoon prior were tempting, it was essential that we pack up and carry on downstream. A trip such as this had always been a dream of mine. Equally passionate about skiing as I am kayaking, I often find myself fantasizing while floating past epic scenery what the surrounding grassy hills and rocky mountains would look like in the winter. 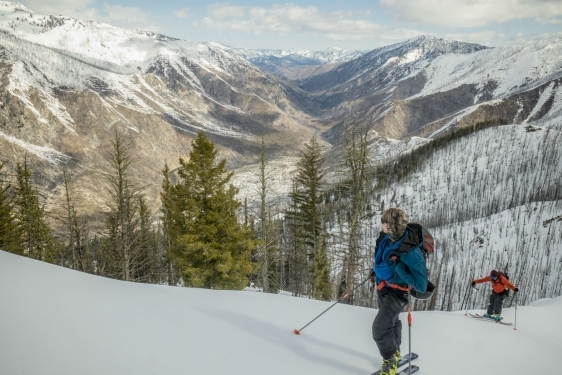 I imagine ski lines everywhere—wide-open powder fields, cliffs, and tight couloirs. 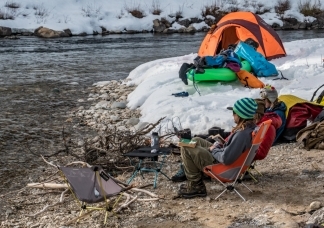 Would it be possible to find a place in spring where snow on the mountains still beckoned skins and skis and the river below flowed with enough ice-free water to paddle? As evident from inspiring trip reports and chats with my kayaking companions, I wasn’t the only curious one. 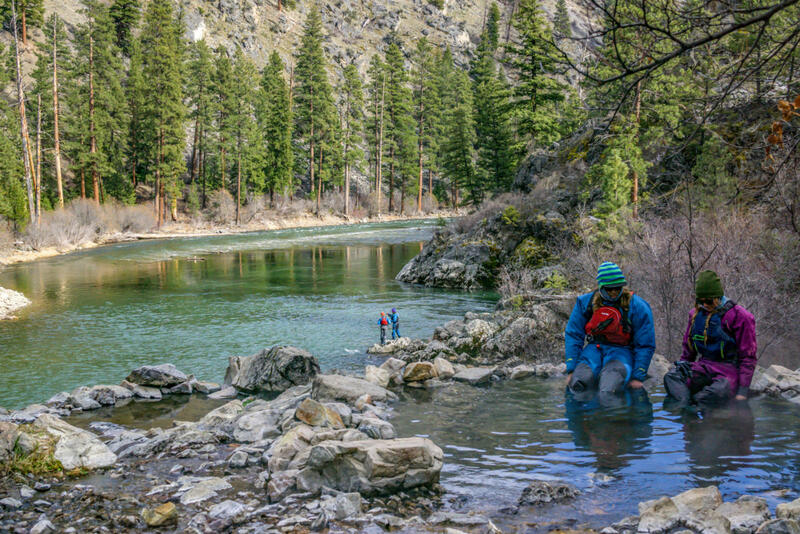 And now, Brendan Wells, Erik Johnson, Brian Burger, Olin Wimberg, Brianna Moore, and myself were on the Middle Fork of the Salmon River, exploring just that. Thus far, we had been extraordinarily lucky. 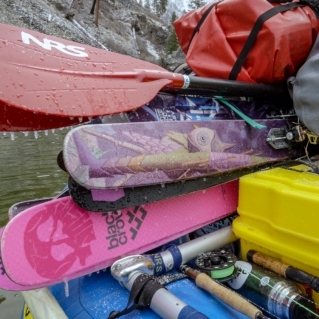 Searching for skiable riverside terrain inevitably means that snow will make access to your classic wilderness river put-ins a bit more complicated. 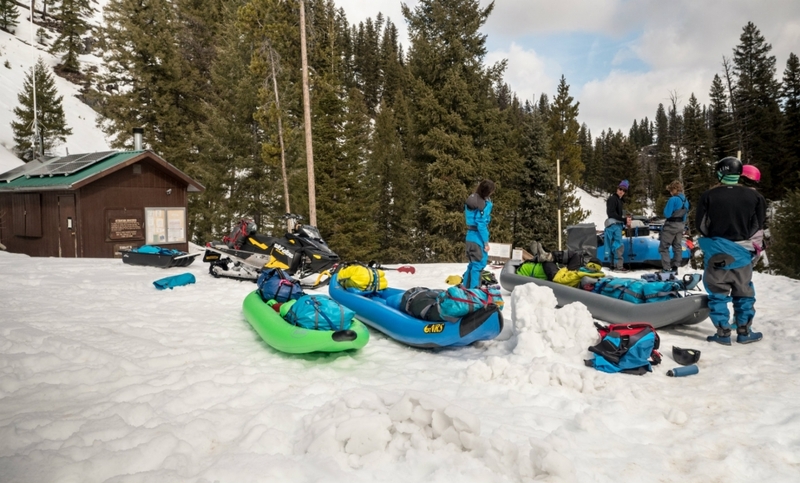 We spent the greater part of a day shuttling all the necessary items for six people in a raft and three inflatable kayaks (duckies) transporting 10 days worth of food and enough gear to ski, paddle, and live comfortably in potential winter conditions. The river was flowing and free of ice. But, the water was suspiciously low and the banks were brimming with snow (which despite the relative inconvenience, was exactly what we were hoping to find). As I fell asleep that night, a mixture of excitement and uncertainty filled my thoughts. But, whatever lay ahead, it was bound to be an adventure. Rigging up at Boundary Creek. It took time, but with teamwork and creative problem solving, we rigged the raft and duckies and prepared to put on. The first rapid was nothing more than a class II split in the slow-moving current, peppered with a handful of boulders. Seasoned kayakers, we would normally not give it much consideration. But, as we pushed out of the eddy, our anxious minds wondered how our heavy crafts would fare in these sparse flows. I was paddling a tandem ducky but with one back thwart fully deflated to allow space for a loaded Bill’s Bag both in the front and back of the craft. Two thirds of the way down this relatively short rapid, I went to turn on the inside of a small rock but instead found myself and my unwieldy craft lodged on top. Terrific. I could still see the put-in and was already pinned. The raft fared similarly. Smaller and more maneuverable, I gradually became accustomed to navigating my hefty blue inflatable, but despite all of his rafting skills, Brendan and his raft mates regularly found themselves jumping about and pushing the raft. 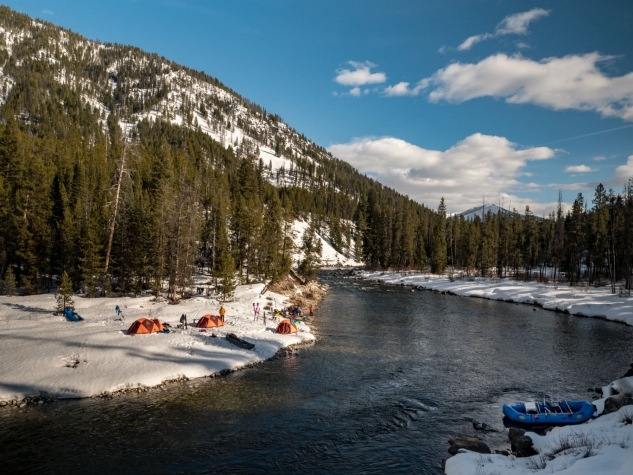 As the raft slowly bumped along the riverbed, it allowed us more nimble non-raft passengers ample time to orient with our surroundings and determine the most promising location to base camp and access the pre-scoped Google Earth potential ski zones. We selected a sunny bend in the river. And, after unloading, we sat back on the tiny beach surrounded by snow, sipping Pabst, and soaking up the sun’s rays, not quite fully realizing what a magnificent oasis we had found. Skinning from camp in the first morning light, we navigated the icy, firm hillside behind our tents and in time found ourselves on an extended split ridge. Trekking left we could ski toward the Big Soldier Fire Lookout and right offered infinite bowls of good-looking ski lines. After skiing a glorious north-facing shot behind Big Soldier, we eventually returned to that morning’s icy hill, which delivered corn skiing all the way back to camp. With a perfect day behind us and ideal access for a repeat day, the team made the easy decision to stick around and ski something else in a similar area the next day. Although, as it turned out, dubious avy pit results prevented us from skiing the lines we had hoped. But the Ski Gods still gifted us with glorious sunshine and corn skiing. We spent three nights at that location, a mere five miles from our initial starting point. On the third morning, we re-loaded the crafts and floated on downstream. Back on the river, progress was slow with the raft continuously lodging on rocks. But the sun was strong, and as we ate lunch in hot springs, ours spirits soared high. 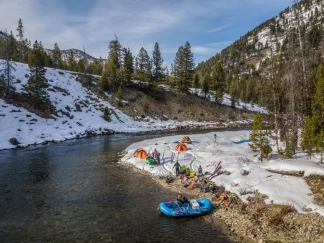 We continued to float, envisioning our next prime ski location, a promising zone of gullies amongst burnt trees caught our attention, conveniently located across the river from the Sheepeater Hot Springs. Skiing access at our new location was significantly less straightforward. We had to ferry the raft without getting ski boots wet, hike alongside a mudflow, skin, and boot back up a mixed snowy, rocky ridge. The conditions weren’t nearly as prime, but there we were skiing on the Middle Fork of the Salmon. We couldn’t complain. 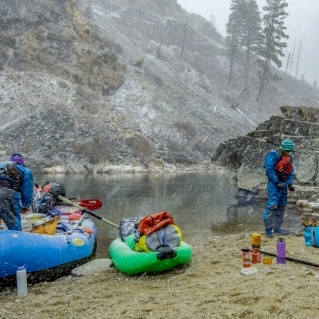 The following day, waking up in the snow and paddling through the squally weather, was a friendly reminder of our lucky weather window and how the trip could have been quite different. As I floated downstream desperately trying to avoid any water splashes, it was satisfying to look back and admire our ski zone from different angles as the river meandered along its course. Good feelings can only warm your soul, though and doesn’t do much for your core. When Burger asked if I was warm enough, I had to admit I wasn’t. 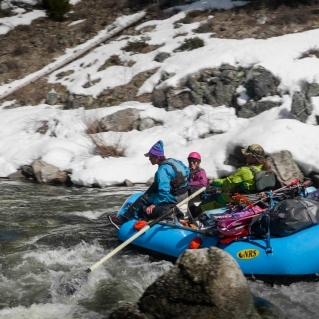 And as I clawed my way through Pistol Creek Rapid, icicles clung to the brim of my helmet. A speedy post-rapid lunch temporarily renewed my insulation, but I spent the latter half of the day paddling excitedly toward that night’s destination: Sunflower Flat Hotsprings, which I knew would be cascading into the river at any point on the right. At this point, the focus of the trip turned to making river miles. We were well over halfway through our proposed trip length, but only a tiny fraction of the way to the take-out. Numerous tributaries continuously increased the flow and we easily attained our daily targets. Hindsight would have allowed for another stop as we passed countless potential ski zones. 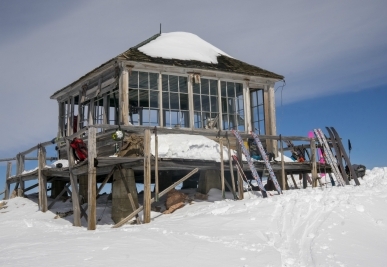 But, those fantasized ski possibilities left the desire to return even stronger. 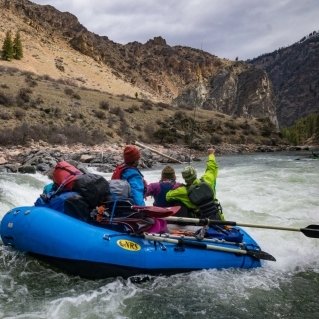 Gradually leaving our snowy reveries behind, the river trip lifestyle ensued in its classic form, reminiscent of the usual rafting and kayaking trips that frequent the Middle Fork of the Salmon. We smashed through big waves, floated in epic corridors, hung out in glorious settings appreciated each other’s company, and paid too much for a beer re-supply. I discovered that inflatable kayaking is difficult and managed to fall out of the duckie not once, but twice. And, to our continued good fortune, the weather remained favorable and we enjoyed every sip of that usually lackluster Blue Moon. It turns out that we certainly were not the only people to wonder about this sort of trip. At the same time, two other crews had embarked on similar trips in the area. 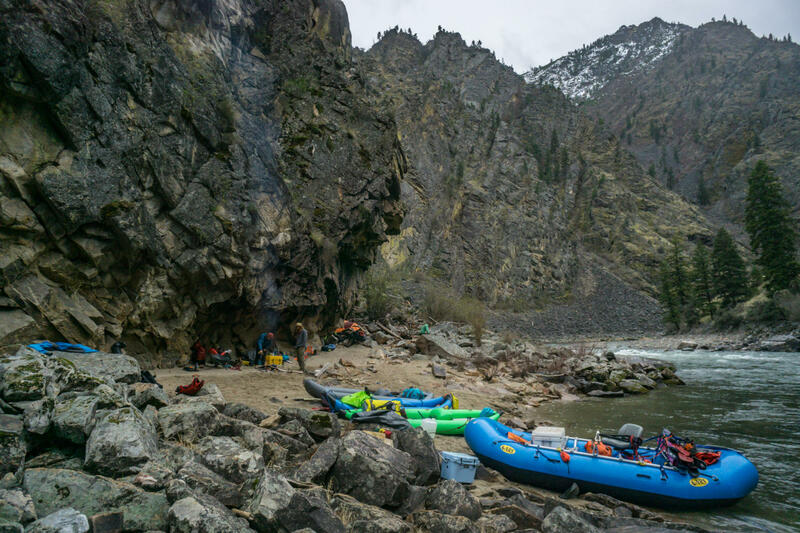 One group explored a remote mountain on river left and floated out on the Middle Fork while Seth Stoenner and Ben Stookesberry accessed ski routes on the South Fork of the Salmon via long boats. 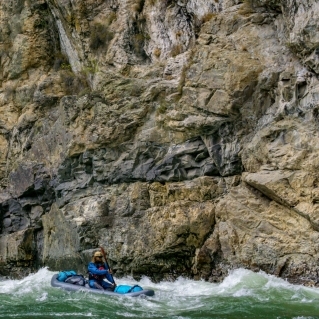 Under a shallow outcropping on our last night sleeping by the river, we daydreamed about the endless possibilities and recalled our good fortune on this first attempt to raft and ski the Middle Fork of the Salmon River. Editor’s Note: All photos courtesy of Brendan Wells unless otherwise noted. 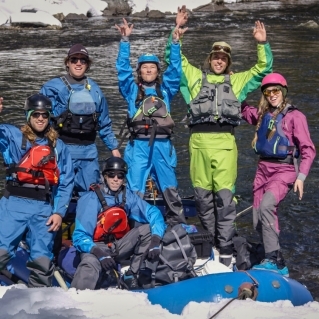 For more on rafting and skiing the Middle Fork, watch the two-part video series from Mountain Mind Media.